Small-scale heterogeneity at the bed-set scale (ca 1 mm to 1 m) represents an important target for reservoir modelling. In particular, tidal deposits, which are typified by bi-directional currents and deposition of alternating mud and sand layers, have a high degree of architectural complexity at the bed-set scale. To quantitatively assess the impact of these small-scale heterogeneities on reservoir performance, we need a method to realistically reproduce 3-D permeability distributions. 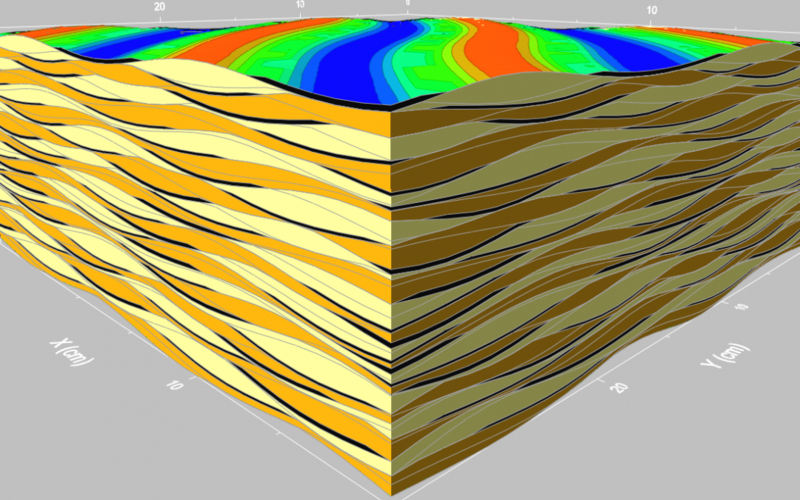 In this paper, we present a process-based stochastic simulation method to simulate 3-D permeability distributions in tidal bedding structures such as flaser and wavy bedding. Our process-based stochastic simulation method differs from existing geostatistical methods in that the formation process of bedding structures has been included in the simulation algorithm. The 3-D bedding geometry and grain-size distribution can be realistically reproduced. The new method is different from previous process-response models because we use geostatistical terms to describe the variation of bedding surfaces. Variations of bedform migration and deposition speed, as well as permeability and porosity distributions along individual bedding surfaces, are modelled. In our method, we model bedding surfaces by a 2-D sine function and a stochastic component described by 2-D Gausssian random functions. Four stages of deposition, migration, and erosion processes have been included to model each tidal cycle of deposition. To generate the correct 3-D geometry, we need to model variations of bedform migration speed, direction and deposition rate at each stage. Because of the periodic nature of flow in tidal deposits, these variations are modelled by a sine function. In addition, a 1-D Gaussian function is used to provide flexibility and introduce variability. A proprietary method has been used to generate realisations of permeability fields on a 3-D regular grid based on the simulated bedding geometry. This method allows us to generate permeability simulations that honour both permeability data and 3-D bedding geometry. Models are evaluated in terms of the sedimentologist’s interpretation of the formative processes of tidal bed forms and the ability to reproduce core heterogeneity (including mmscale permeability grids). Wen, R., A. W. Martinius, A. Næss and P. Ringrose, 1998, “Three-dimensional simulation of small-scale heterogeneity in tidal deposits,” In: Buccianti, A., et al. (editors), Proceedings of the 4th Annual Conference of the International Association of Mathematical Geology, DeFrede editore, Ischia, pp. 129–134, 1998.